Instagram isn’t just for food and selfies, it’s a e-commerce platform where people sell lots of interesting stuff – from food to art and fashion. Here are a few Kolkata-based Insta handles that will let you take you everyday look up a few notches with customisable handcrafted jewellery. Shreyasi has been interested in creating handmade gifts for friends and family since she was a child. It was in college that she began making jewellery for friends. And soon, people started asking her to create some for them. It was in 2017 that she started doing this seriously and eventually set up a business profile on Instagram. Since then, Kagojer Tori (the paper boat) has been sailing the world of crafts charting its own path. 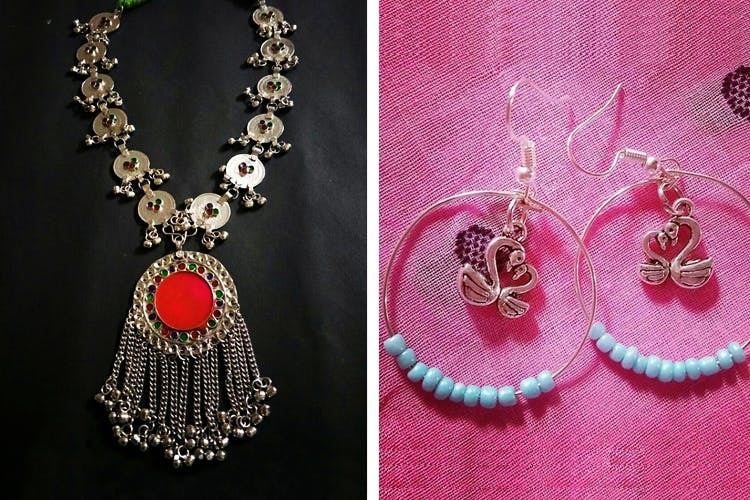 You can pick up junk jewellery, dreamcatchers and other handmade accessories for as low as INR 40. Shaajgoj is a Kolkata based start-up which was started by Sreetama Kundu and Sarita Das. The page started its journey of adorning individuals with its jewellery on Valentine’s Day in 2018. At Shaajgoj (which essentially means ‘decking up’), you can get earrings, nose clips, necklaces, chokers, bracelets, anklets and much more. The best part is the pocket-friendly prices that start from INR 80. They also do customisations and recreate new designs from your old jewellery. They ship their products across the world and accept payments via Internet banking, PayTm and Tez only. COD is available for pickups within the city. Alankar is your one stop destination, where you can find trinkets for everyone – from your toddler to your grandmum, because jewellery is something that fits everyone and each piece has its own story to tell. Sanchaita started her Insta store in 2016 keeeping everything limited until her page started to grow. She kept minimalistic pieces starting as low as INR 50. Her favourite part is customisation. This one deals in German silver (an alloy of zinc, copper and nickel) jewellery and antique pieces. They make earrings, bangles, finger rings, wristlets, chokers, nose pins and hand harnesses with prices ranging between INR 20 and INR 500. Owned by 21-year-old graduate Ayantika Malakar, Anusha's Creations started in August 2017.